Flash drives are getting increasingly popular with the price reduction. In the old days you had to pay almost two hundred dollars for a flash drive of only 32MB, today the most popular models are of 256 MB since their price dropped to 50-60 dollars. If you are not looking for high-performance models, a flash drive of 512 MB can be bought for only a hundred dollars, that is they have already approached the "psychological borderline" :). Though only in price but not in capacity – 256 or, moreover, 512 MB is obviously enough in most cases for storing all your work files, but... Even now CD is still a unit of capacity measurement among those users who need to transport large data volumes, and it's more than 512 MB. What can we use to carry data, which volume is several CDs? Portable hard disks leap to mind right at once, but the question is which ones. The most compact models of the inch form factor are not far from flash drives with their capacity and "dollar/megabyte" ratio, so if you need to transport several gigabytes of data in one operation it's not your choice. Models based on standard notebook hard drives do not look like pocket-size storage devices: some of them fit into pockets but occupy too much space, so they are not convenient to carry on you. External storage devices based on 1.8” hard disks could have been a good compromise, but such models can be rarely found on sale – such hard disks are bought up wholesale by player manufacturers, etc. At the end of the last year we already reviewed one of the rare representatives of such devices, but because of its not very good Archos bridge ARCDisk worked a little slower than it could (at least modern flash drives work faster). Since that time such storage devices have become (at least virtually) more attractive, as hard disk manufacturers launched 40 and even 60GB models – that is by their capacity 1.8” hard disks are almost on the level with 2.5” ones, and there is actually no need in larger volumes for portative storage devices. Thus, the demand for such devices exists, but the supply leaves much to be desired, so any such device is a noticeable event on the market. Today we shall review one of such models. Even if such storage devices were on sale everywhere, LaCie Data Bank would have attracted attention anyway, at least by its outstanding design. 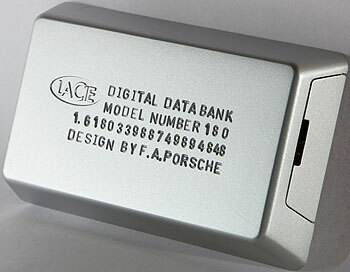 Design of one of the series manufactured by this company is developed by a world-renowned design-studio F.A.Porsche, and Data Bank belongs to that series. So, let's examine this issue in more detail. Hard disk of a small form factor allowed to make this storage device very compact – just 111 x 63 x 16 mm with the weight less than 140 g. Actually, ARCDisk is more compact, but we can excuse Data Bank dimensions because it was done on purpose. This storage device resembles a standard platinum bar and is colored correspondingly. The resemblance is backed up by the label on the top facet, the only discrepancy is a small cover on the flank that protects connectors. However it's rather difficult to notice it at first glance, so it's all right. By the way, the design is well matched by the package: A black case is used instead of a common box. The storage device lies in the middle of the case covered by black foam-rubber like a real jewel :) The other bundle components are hidden. Thus, it's not just an interesting device (we shall prove that later), but a perfect present at that. There are four Data Bank models available for today. First of all they differ by hard disk capacity: two models are of 20 GB, the other two – 40 GB. Secondly, these storage devices have different interfaces. To be more exact, USB 2.0 is supported by all the four models, but two of them (of different capacity) also support FireWire. It should be noted that the combo-interface is a rare thing even in storage devices with hard disks of the large form factor, so FireWire support is a significant advantage of this little one (we have recently found out that this interface is much faster when the external hard disk is used as a working one). When connected to USB-port, you can identify the type of the hard disk inside the storage device – it's one of Toshiba models. According to the official web site of the manufacturer, this model has the rotational speed of 4200 rpm and a 512 KB cache (yes, these "little ones" are quite modest so far). However you cannot identify the FireWire controller type in the Device Manager list – all LaCie FW-storage devices are listed by their names. 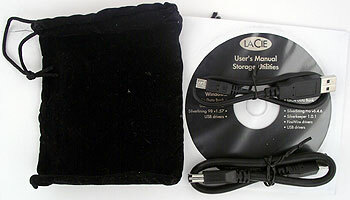 As I have already said, the storage device is packed into an imposing black box, which reminds of jewelry rather than of computer components. The box also contains a couple of cables (very short, because the storage device belongs to very compact models), a sack to carry the device, and a CD with documentation, drivers and software. The latter is mostly oriented to Macintosh users. There is only one Windows utility for formatting disks, but this utility is designed for Windows 98 so one can say that the CD contains no Windows software at all. The testbed has been changed in comparison with previous reviews, which should have seemingly rendered invalid the comparison of old test results with new ones. But it's not that simple – we have previously used a mainboard based on VIA KT600, and now we use K8T800, but the southbridge remained the same – VIA VT8237. USB-controller is integrated right into the southbridge, so it was not changed either. Previous analyses allow to assert that the operating speed of USB and FireWire devices depends only on the connected controllers and on no other hardware parameters (but the operating system may have a certain influence). I have compared once again the speeds of several devices in the old and new systems – they didn't change (naturally). Thus we are lucky to be able to bring together the results obtained during the whole year. What concerns FireWire, nominally, the controller was also changed – the previous mainboard contained the VIA VT8306 chip, the new one is equipped with VT6307. But it turned out that these chips differ only by the number of supported ports (three for the former and two for the latter) demonstrating absolutely identical speed. We used HD Tach 2.61 and AIDA32 3.93 (to be more exact, some tests included into these utilities) to measure operating speed. From the first program we took only results of the access time and the peak throughput tests, read and write speed measured in this program cannot be taken into consideration – these results have little to do with reality. In AIDA32 we used three tests: access time, linear reading and linear writing. These results will be quite enough to evaluate the suitability of the device to transport data. In practice absolute figures are not that interesting than the comparative analysis of performance of different external hard disks. The only problem is that Data Bank is the second storage device based on 1.8-inch hard disk tested in our lab. It goes without saying that the first tested device of the same class (Archos ARCDisk) will also be included into the graphs. To complete the picture I decided to include test results of two storage devices with combo-interface based on larger 2.5-inch hard disks – IDS ZIV Pro (with Fujitsu MHT2060 AT – 60 GB, 4200 rpm) and Sarotech Cutie DX FHD-254 (with Seagate Momentus ST94811A – 40 GB, 5400 rpm). Besides we shall see whether we'll have to pay for the compact size of external hard disks with operating speed (a priori 1.8-inch models must be slower than 2.5-inch ones, especially with higher rpm). The most essential impact on this parameter has the rotational frequency of the hard disk, but disks with smaller platters are theoretically capable of outscoring larger models due to smaller distances of head movements. But this is theory, let's see what happens in practice. No miracles happened. Access time to both storage devices based on 1.8-inch disks is even worse than that in ZIV Pro based on a 2.5-inch hard disk with the same rotational speed. We do not take into account Momentus with high rotational speed – it is faster by a quarter (in fact the same advantage is in its rotational speed). This parameter prevented Archos ARCDisk from demonstrating good results in read/write tests: of course here we mean the peak interface performance, which may not be reached due to mechanic failures in hard disks, but... a higher speed is absolutely impossible, so a bad controller can spoil results of any hard disk. Fortunately, in case of Data Bank you have nothing to worry about: with the USB interface it demonstrated no way remarkable but quite normal results, and with FireWire it turned out the fastest. Thus, linear speeds (as we have already found out, application emulation has its fine points) will depend only on the performance of the hard disk. No miracles happened. 1.8-inch hard disks are considerably slower than their "elder brothers": somewhat outdated 4200 rpm models are approximately 1.5 times faster, and 5400 rpm storage devices are even 2 times faster. Moreover, the best models of flash drives also reached such speed. But Data Bank has a huge advantage over its immediate competitor from Archos. Controller is not a bottleneck in this case, and the launch of faster hard disks of this form factor will allow to increase the performance. Unfortunately, Toshiba hard disks are famous for their good appetite and so many companies are skeptic about their usage in mobile storage devices with USB interface: power is not always enough. Data Bank works perfectly, but I didn't manage to measure its power consumption as I had already done it with flash drives: to all appearances because of a multimeter adapter (perhaps due to an additional link and thin wires, but ZIV Pro in these conditions works as if it's connected directly to the port with a native cable). Even by touch you can feel that it consumes much power – this storage device heated up considerably during the tests: heat level can be compared with Seagate Momentus and it's much higher than in Hitachi hard disks (at least in 4200 rpm models), to say nothing of Fujitsu. Data Bank has its pros and cons as everything in this imperfect world. Out of justice it should be noted that all of them are due to advantages and disadvantages of hard disks of this class, LaCie does its part of job perfectly. Design is developed by professionals, bridges possess sufficiently high speed, there is a low budget model with USB 2.0 only as well as a universal model with two interfaces. But what concerns 1.8-inch hard disks... On one hand their usage allowed to make this storage device so tiny, which is a huge plus. On the other hand, the cost of 1 MB storage on these hard disks significantly exceeds this parameter for 2.5-inch HDD, and thus even the entry-level Data Bank model will cost you a pretty penny. Besides, it's too early to compare the operating speed – "classic" mobile hard disks are faster by several fold. But not only hard disks – flash drives also reached the level of 12-15 MB/sec, so they can compete in speed with Data Bank and others of like ilk. Optical storage devices are lagging behind once and for all: 16x DVD is of course faster, but it's more correct to compare portative hard disks with RW discs, and they are not in a hurry to accelerate their speed higher than 4x, which gives only 5.5 MB/sec. Thus, as it always happens, the storage device will not be able to satisfy everybody. What users can be recommended to use it? If you are interested in a portative storage device of a sub-pocket size, you need to transport several gigabytes of data at one go, and you are ready to pay a reasonable price, then you really need a device of this class (otherwise you'll have to find something totally different). At present Data Bank has no competitors in its class (at least we haven't heard of them).